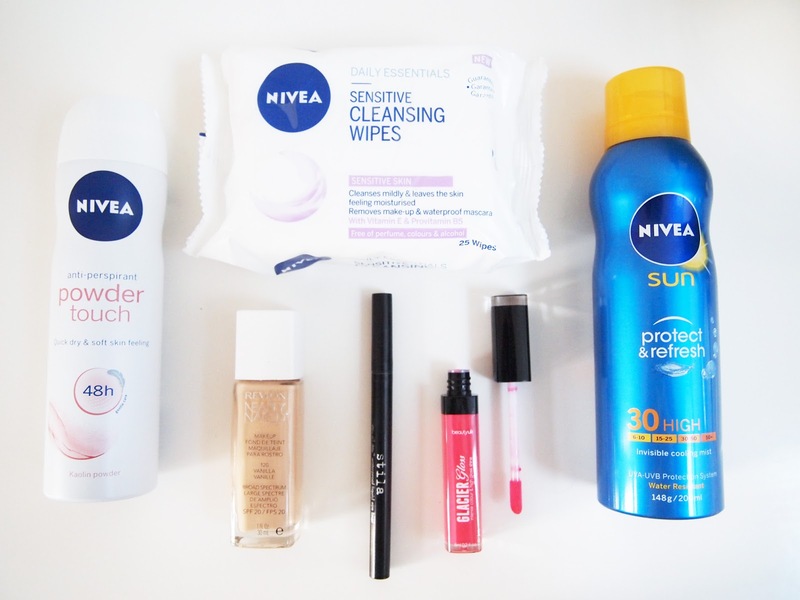 So here is my second post on festival essentials - this time a focus on beauty and skincare...and deodorant. Deodorant Not much to really go into here...pretty obvious as to why this would be in your bag - I like this Nivea one as it's got a lovely scent and does the job! Face Wipes Ahh the humble face wipe. Shunned by many a beauty blogger but I think a festival is a good exception. There are so many choices out there, even baby wipes can do the trick, but as I find some wipes a bit scratchy I like to use these Nivea Sensitive Skin wipes as they are a little more delicate. Plus they remove eye make-up pretty darn well. Light Foundation For me, festivals aren't really the place for lots of make-up (unless it's glitter that is) so a light foundation works well just to make yourself look a little fresher after the night before. Revlon's Nearly Naked is a great light coverage foundation that goes on easily and isn't too shiny so doesn't need a lot of blotting. Eyeliner You can't go wrong with a slick flick of eyeliner - whether thinly applied or in a dramatic 60's style. As you want it to last all day and night - I'd recommend this Stila liquid liner pen. It is a-mazing, so easy to apply and it won't budge - not matter how much you party the night away. Bright Lips Just like a quick flick of eyeliner, a bright pop of colour is a simple way of looking like you've made an effort. You could pick your favourite lipstick, but I'm loving bright lip glosses at the moment like this one from Beauty UK (I'm wearing it in this post). Sun Cream Yes I realise the thought of it actually being sunny at a UK festival seems somewhat foolish however even when it's cloudy you should put some sun cream on - just in case. No one likes a lobster! This Nivea cream comes in a snazzy aerosol style spray - I don't regularly get excited over sun cream but this stuff is amazing! It comes out pretty much dry so you won't feel all sticky which is perfect when you just want to get out there and enjoy the day. Again, let me know what your essentials would be - I'd love to know! I love the look of that lipgloss, such a pretty colour! Oooo, that Nivea deodorant looks so interesting!! Using the same Nivea deodorant at the moment and I'm so pleased with it! Absolutely agree with all of your festval must-haves. The face wipes are a great no-fuss solution!